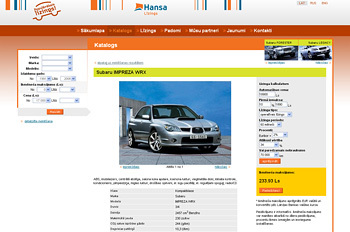 The website is based on the idea of the largest car catalogue that would give anyone a possibility of a fast and convenient overview of nearly all car models available in Latvia, together with their prices; the catalogue also allows choosing the most suitable car and immediately applying for leasing. The clever use of Internet technologies allowed us to find a solution letting the most topical information be available on the website without any intermediation – all descriptions and pictures are placed on the web page by car dealers themselves. The quality is controlled by Hansa Līzings. 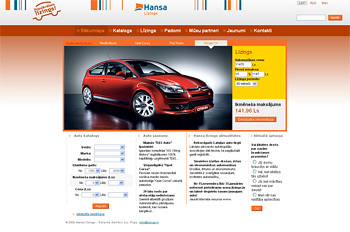 On our website you will also find in-depth information about the services of Hansa Līzings, hints and tips, news, a list of partners, special offers, competitions and a lot of other useful information. You no longer have to try to imagine the biggest automobile shop on the internet. It’s already here.